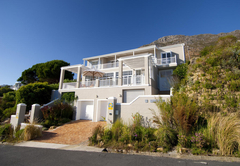 Felsensicht Holiday Home is a 4 star graded property offering Simons Town accommodation for up to 6 guests. 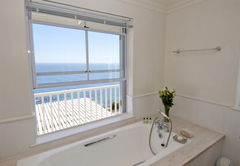 We are superbly situated near Boulders Beach, Simon’s Town, with a 180° view of False Bay stretching from Muizenberg in the north to Cape Point in the south. 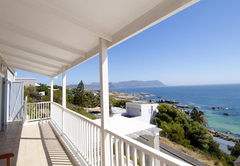 On a clear day there are views of Stellenbosch, Gordon’s Bay, Seal Island and Cape Hangklip. 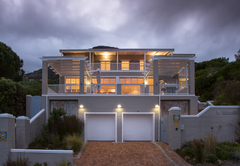 Felsensicht is an ultra modern, large, attractive and wonderfully comfortable home. 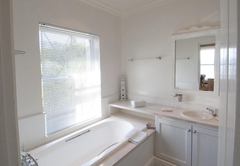 It is beautifully furnished with all mod cons. 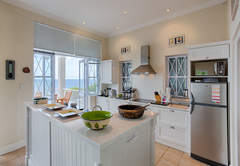 All necessary linen, cutlery, crockery, glassware, pots and pans etc are provided. 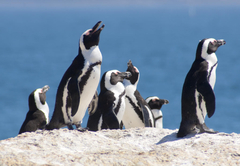 The house is a 2-minute walk from Fisherman's Beach (which has good boogie boarding or sea kayaking, depending on sea conditions) and a 20-minute walk from the world famous penguins at Boulders Beach. 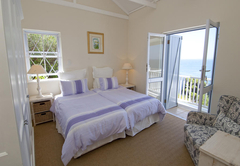 We are able to accommodate up to 6 persons in 2 double rooms and 1 twin room. 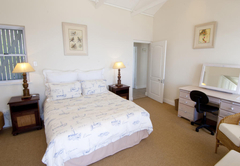 The accommodation is self-catering. 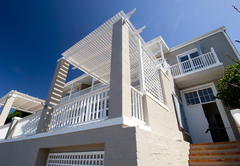 On the ground floor there is a large double garage with storage area. 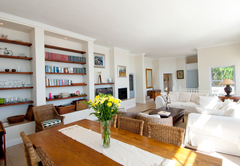 The middle floor consists of an open plan kitchen, dining room and lounge area. 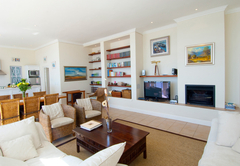 There is a Jetmaster fireplace, satellite TV and underfloor heating. 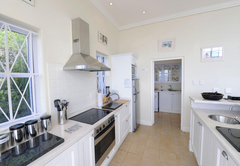 The kitchen has a glass-top stove with oven, a fridge freezer and a microwave oven. 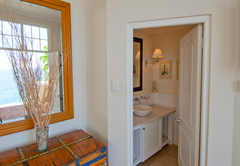 The washing machine, dishwasher and tumble dryer are located in the scullery. 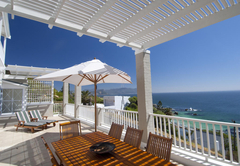 There is a large outdoor sea facing patio area with a Weber for barbeques. The views from here are magnificent. 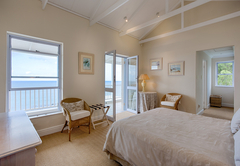 The upper floor consists of three bedrooms each leading out onto a sea-facing patio. 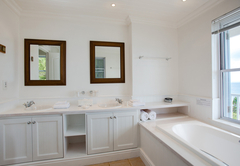 The main bedroom has a bathroom en-suite with bath and shower. 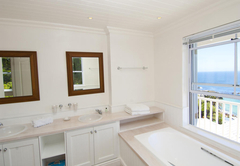 A second bathroom, also with bath and shower, serves the second and third bedrooms. 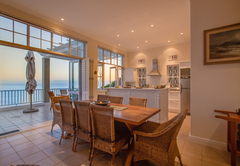 Free Wi-Fi is installed throughout the house. 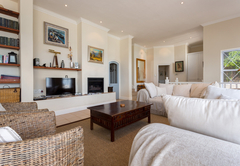 We offer our guests a complimentary cleaning service once a week. 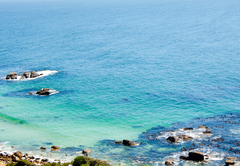 The following beaches range from 200m to 2 km from Felsensicht: Fisherman’s Beach, Windmill Beach, Boulders Penguin Beach (National Heritage Site), Foxy Beach, Water’s Edge and Seaforth Beach. 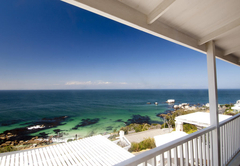 Long Beach, Simon’s Town, is 4 km from Felsensicht. 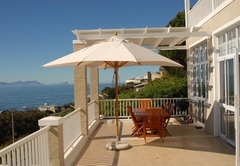 Swimming, body boarding, surfing, windsurfing, sea kayaking, scuba diving, big game fishing, shore fishing off the rocks, yachting at False Bay Yacht Club, whale viewing at Cape Point, Boulders, Simon's Town Bay, Glencairn, Kalk Bay and Seal Island - home of the Great White Shark, penguin viewing at Boulders Beach National Park, golf, squash, bowls at the Simon's Town Country Club, 800m from Felsensicht, birding at Rondevlei, Seekoeivlei, Swartvlei, boat trips out to sea, cycling - wonderful routes in Cape Point Nature Reserve, along Chapman's Peak and a host of various routes from Muizenberg to Smitswinkel Bay to Scarborough and Kommetjie. 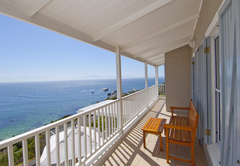 The Cape Point Nature Reserve and Cape Point itself where you can enjoy a trip on the Funicular up to the Cape Point lighthouse, the SA Naval Museum, the Toy Museum and the Scratch Patch (where you can scratch for gemstones and purchase a wide variety of gemstone gifts), all located in Simon's Town. 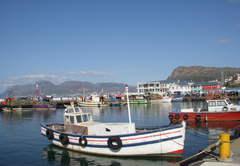 There are also a whole host of quaint shops all along the main street of Simon's Town including its very own waterfront. 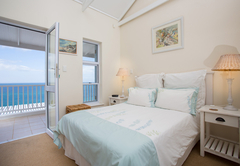 This 4 star self-catering holiday home has 2 double rooms (1 of which is en-suite) and 1 twin room (sleeps 6 guests). 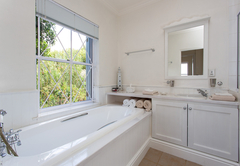 There is a 2nd bathroom with both bath and shower which services the 2nd and 3rd bedrooms. 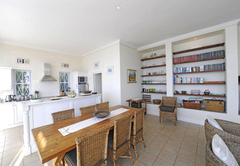 There is a very large open plan lounge / dining-room / kitchen area and patios. Weather near perfect. Felsensicht 110%+. What a beautiful home-from-home. Thank you, René and Gail, for the use of your creation, and thank you, Jim, for your welcome and care. Dear Gail I recently stayed in your home with Johan de Bruyn, his wife and some friends from Ireland. I just want to say a personal thank you to you. I had the most relaxing few days with a little hiking thrown in just to remind me life isn't always a lazy day on the beach. 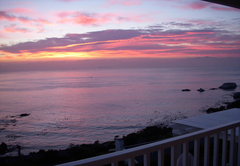 The wonderful views and precious memories will stay with me wherever I journey. 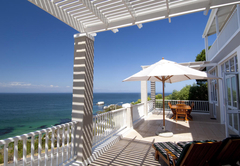 You have a beautiful home and I thank you for sharing it with us. Thanks to your lovely witty Caretaker too. Kind regards Eileen O'Grady Ireland. Response timeFelsensicht Holiday Home typically responds to requests in 5-10 minutes.